Sheridan School District is partnering with the Sheridan Lions Club to provide more advanced vision screenings for its students in kindergarten through 2nd grade. This week, members of the Sheridan Lions Club are volunteering their time to offer free vision screenings at Sheridan Elementary with a Spot Vision Screener they purchased in 2016. They will provide vision screenings at East End Elementary during the week of Oct. 23. The Sheridan Lions Club purchased the Spot Vision Screener because sight is one of the Lions Club’s defining causes. Lions Clubs International, which was founded in 1917, has worked on numerous projects in an effort to prevent blindness, restore eyesight, and improve eye health and eye care for hundreds of millions of people around the world. 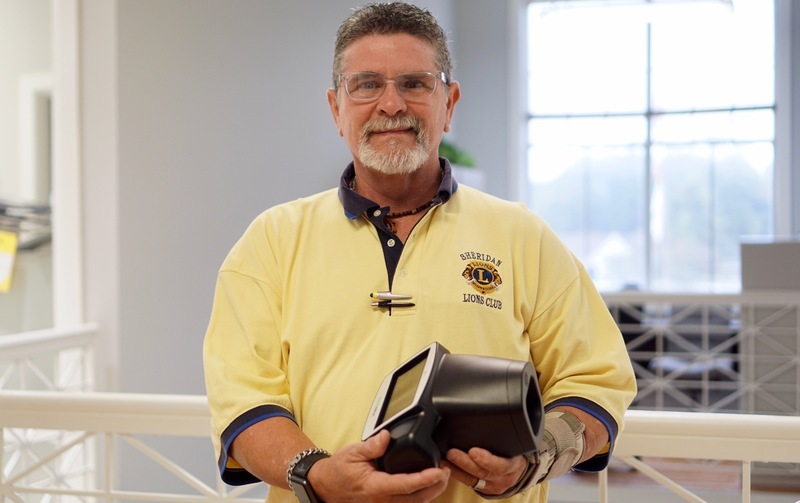 Jimmy Maples (shown above), vice president of the Sheridan Lions Club, said Helen Keller inspired the Lions Club International to become interested in sight programs soon after the organization was founded. As a child Helen Keller overcame the adversity of being deaf and blind and later became an educator, journalist and one the 20th century’s leading humanitarians. She attended the Lions Club International Convention in 1925 and challenged the Lions to become "knights of the blind in the crusade against darkness." Maples said that by providing these screenings at Sheridan Elementary and East End Elementary, he hopes to help many children in the community who have undiagnosed vision problems so they can see better and learn better. According to the Journal of Behavioral Optometry, more than 12 million children in the U.S. have an undiagnosed vision disorder and one-third of children do not have a vision screening by the time they enter kindergarten. While the Spot Vision Screener does not replace a complete eye examination by an ophthalmologist or optometrist, it does detect the potential presence of six vision risk factors, including myopia (nearsightedness), hyperopia (farsightedness), astigmatism (blurred vision), anisometropia (unequal refractive power), strabismus (eye misalignment), and anisocoria (unequal pupil size). The Spot Vision Screener is easy to use and ideal for mass public screenings. It is a lightweight, handheld device that can provide up to 60 screenings in an hour. The device is non-invasive and can screen a subject from about three feet away with a capture time of one second. After the screening, the data is captured and the results of each screening can be printed out in an easy to understand summary. In order to maintain student confidentiality, the students are being assigned numbers so that only the school nurse can match up the screening results with each student. The Lions Club volunteers will not have access to any of the students’ personally identifiable information. At both Sheridan Elementary and East End Elementary, the school nurse will provide a summary report for the parents of those students who show signs of having one of the six vision risk factors, as detected by the screening device. It is recommended that these children go to a follow-up appointment with an eye doctor.